When a favourite treat has a "new, improved recipe" there is always a tendency to believe that the manufacturer has simply found a way of making it more cheaply. As a result, consumers often get turned off. With Easter approaching, it's apposite to see how this syndrome has affected one of the nation’s most-loved treats – the Cadbury Creme Egg. When Cadbury's was sold in 2010 there were fears its products would be altered and taste less like Cadbury's. Last January, at the start of the Creme Egg selling season, the manufacturer confirmed that they were no longer made from Cadbury Dairy Milk but instead from "standard cocoa mix chocolate." There were howls of displeasure from many commentators, with one describing the new recipe as creating a "Frankenstein’s monster of an egg." YouGov BrandIndex data shows that the public also has reservations about the changed treat. I have compared consumers' satisfaction for the brand on January 1 and 21 March over the past three years to see the impact of the recipe change. In 2014, when the eggs were still made with Dairy Milk, satisfaction rose during the prime sales period. 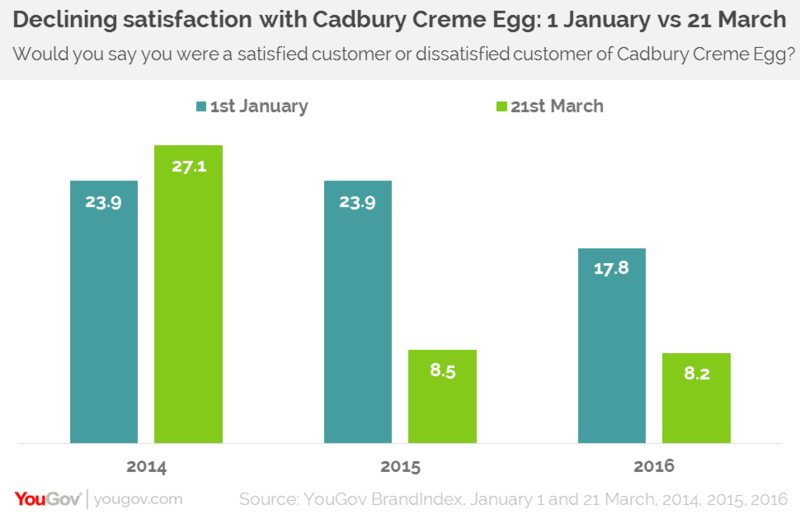 In the two years since, as the sales season progressed, fewer and fewer people were satisfied with Creme Eggs. This has had a knock-on effect on the number of people buying the treat. 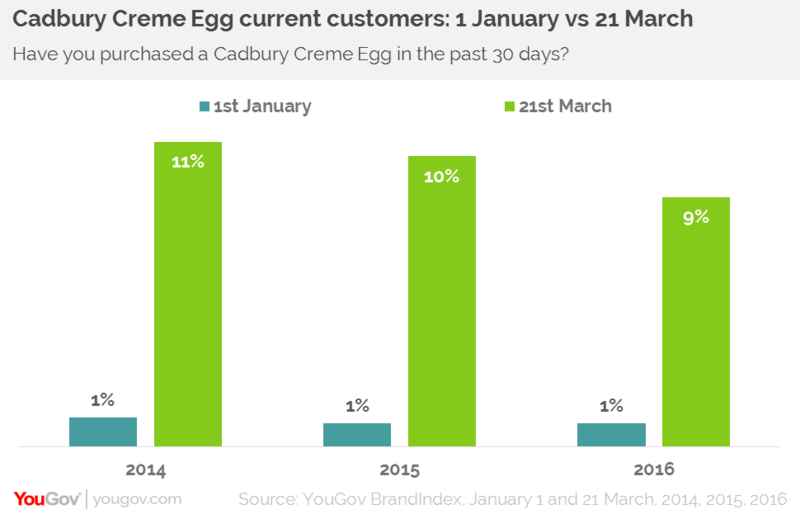 Again comparing the data from 1 January to 21 March, in the Spring of 2014 when Creme Eggs were everywhere, current customers rose from 1% to 11% of the population. In the run-up to Easter 2015 it fell to 10% and this year it has declined to 9%. While small, there is a clear, steady fall in the number of people saying they are buying Creme Eggs. There is a long history of brands changing how a product is made and displeased consumers voting with their feet. Manufacturers need to think long and hard about whether the recipe fix is worth the reputational hit.